I read this story last night, it is a must read for all pet lovers. I began reading it last night to my kiddos, and kept coming back to it during my nightly chores. I ed it! It is about a bulldog, named Bill who goes to the rainbow bridge. His owner is very heartbroken, and I will not give any *spoilers*, but it tells about how he deals with the loss of his beloved Bill, and has a two sided story about Bill at the Rainbow Bridge, and his owner, left missing his best friend. The writer, Dan Carrison, recently became a member here at English Bulldog News. If you do get it and read it, please let us know what you think in this thread. I laughed, I cried, and I went to sleep last night with a smile. The owners of departed pets want to know: that their pets are happy, that their own grief is normal, that they will be reunited with their pets one day, and that it's OK to love again. Bill at Rainbow Bridge-- written for all who have ever been blessed by the unconditional love of a pet-- fulfills these wishes. This heart warming, poignant and profound story takes place at Rainbow Bridge--where departed pets play and romp, as they await their owners, at the threshold of the afterlife. Closer to home, a grief-stricken man tries to cope with the loss of his beloved English Bulldog, Bill. 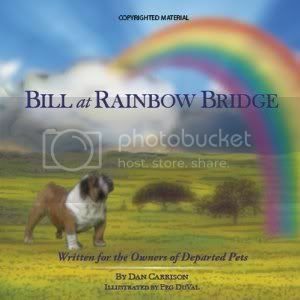 The delightful characters at Rainbow Bridge include Bill the Bulldog, Annie the Tabby cat, and Willow the female Pug. The human characters are no less intriguing: David, Bill's heart-broken owner; Greg Baxter, a psychologist active in Animal Rescue, and Elizabeth Browning, the guiding light behind a therapy group for the owners of departed pets. Bill at Rainbow Bridge is a modern family classic, written for all who love animals, and illustrated by the renowned artist Peg DuVal. This heart warming story will fill you with hope--and will make you "cry for happy." It also makes the perfect gift for the pet-lover in your life. I just read the link to little dog that died written by him and it was wonderful. I can imagine this one also is very good. If the story is half as lovely as the beautiful cover picture, it will be well worth ordering! !